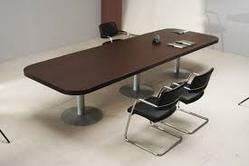 We offer 'Office Conference Table' Model : CT-4 from Inspace India. We are successfully meeting the varied requirements of our clients by providing the best quality range of Conference Table. Our expertise also lies in manufacturing a wide range of Conference Tables and Chairs that is made using fine material. These tables are perfectly designed to provide the comfort of sitting and are available with rubber wood arm rest. The designing of the furniture is done in accordance with defined industry norms. We are looking for Delhi/NCR query's. MDF with painted to make conference table with combination of Standard tables, Connection tops and metal legs. There are three types to combination which can make a perfect conference table. This kind of conference table can accommodate eight persons comfortably. The two main sides of this table is covered with a piece of wood. This is an elaborated table and looks very professional too. This table is preferred by our clients from all corporate. These are offered in a light shade of brown color and are preferred by many of our clients all over the country. Purpose is to provide our audience the opportunity to exchange Ideas, Debate, Develop New Contacts and participate in Informed, Impartial and Leading Edge discussions. Get an opportunity to meet the ultimate decision makers at the futurehind conference.